PRICE: C$7.90 - 227g / 8 oz. 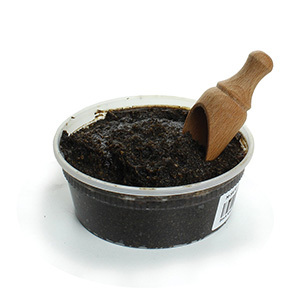 100% Natural African Black Soap Paste... For Face - Body - and Hair. This natural black soap is hand-crafted in West Africa using centuries-old techniques. Made with extra palm oil, palm kernel oil, and plaintain leaves... this soap is famous for relieving the effects of acne and removing blemishes. It is also an effective hair shampoo, preventing dry, itching scalp and dandruff. Made In Ghana, South Africa. Normal shelf life is 24 months after receipt of purchase. To prolong the shelf life of the natural black soap, keep it in a cool, and dry location. After using your black soap in the shower you can then store it in an air-tight container or zip-lock bag in a cooler and drier section of your home. Gently rub a large pinch of soap in your hands to create a lather. rub the lather or soap on all areas of your face, and rinse. Black Soap Paste is powerful. Use carefully with sensitive or dry skin. Lubricate your skin after cleansing should you have a drying effect. Palm Oil, Palm Kernel Oil and Plantain Leaves. Normal shelf life is 24 months from date of purchase. To prolong the shelf life of the natural black soap, keep it in a cool and dry location. After using your black soap in the shower you can then store it in an air-tight container or zip-lock bag in a cooler and drier section of the house. Gently rub a large pinch of soap in your hands to create a lather. Rub the lather or soap on all areas of your face, and rinse. The Black Soap paste is powerful. Use carefully with sensitive or dry skin. 100% Natural African Black Soap for Face, Body and Hair This natural black soap is hand-crafted in West Africa using centuries-old techniques. Made with extra palm oil, palm kernel oil and plantain leaves, this soap is famous for relieving the effects of acne and removing blemishes. It is also an effective hair shampoo, preventing dry, itching scalp and dandruff.